Toungoo District, colloquially-referred to as Taw Oo in Sgaw Karen language, is located roughly in the northwestern part of Kayin State. Government maps identify Toungoo District as Thandaung Township. Toungoo incorporates a portion of Eastern Bago Region, around Htantabin Town, and shares borders with Mandalay Region and Shan State to the north, Karenni State to the east and the remainder of Bago Region to the west. Toungoo District is the northernmost region of the locally-defined Karen district with the Hpapun and Nyaunglebin borders to the south. The district is split into two locally-defined townships by the Toungoo - Mawchi vehicle road. These townships, namely Than Daung, also referred to as Daw Hpa Koh, in the north and Tantabin, or Taw Ta Tu, in the south, do not appear on Government maps. The westernmost stretches of the region are situated in the fertile Sittaung River basin, which gives way to the Ka Ser Lu mountains, in the east. These rugged and heavily forested mountains cover the vast majority of the eastern portion of the district. Many of the inhabitants of Toungoo District are various Karen ethnicities who speak Geko, Gebar or Bres dialects and traditionally live in small remote villages throughout the steep eastern hills. Civilian communities in Toungoo District live under varied degrees of Government control and, during the conflict era, responded in diverse ways to evade military demands and restrictions. The soil quality and terrain in much of Toungoo District supports only limited rice or paddy farming, so most households are dependent on income generated from various plantation crops, such as betel nut and betel leaf, cardamom, durian and dog fruit. 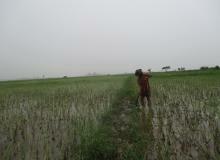 The loss of one year's crop has devastating consequences for villagers' long-term food-security. During the conflict era, residents of relocation sites or other Government-controlled villages were subject to frequent demands for forced labour and experience movement restrictions, which undermined residents’ ability to transport goods and use profits to purchase rice and other basic commodities. Villagers living outside Tatmadaw military control often travel to trade with Government-controlled communities. Tatmadaw patrols have carried out attacks on villages in Toungoo District since 1974 and 1975, when the Tatmadaw initiated pya ley pya or "four cuts" campaigns for the first time. Major offensives again in 1992 and 1996 added to internally displaced populations of villagers actively hiding from Tatmadaw soldiers. Tatmadaw operations divided the district in the late 1990s, stationing its Western Command units north of the Toungoo – Mawchi vehicle road in locally-defined Than Daung Township and the Southern Command units south of the road in Tantabin Township. In 1995, the Tatmadaw attempted to drive all of the villagers out of the hills in Tantabin Township and into military-controlled relocation sites where villagers were closely managed and used for forced labour. Between 1995 and 1998, villagers throughout Tantabin Township were forced to construct a road from Kaw Thay Der to Bu Sah Kee to facilitate the Tatmadaw’s control over that area. A group known as Nyein Chan Yay A’Pweh (Peace Group) appeared in Toungoo District during late 1997. This group was composed of soldiers from the KNLA’s 2nd Brigade who had surrendered in the far north of the district. The larger villages along the car road, such as Kler Lah, Kaw Thay Der and Naw Soe have been under Tatmdaw control since the 1997 offensive. Kler Lah village became a relocation site when all the residents of the villages to its north and east were forcibly relocated there in 1998. The Tatmadaw Sa Thon Lon Dam Byan Byaut Kya ('Guerrilla Retaliation Units') first emerged in the plains of Nyaunglebin District in September 1998. These units operated as small 8-10 man, specially trained squads and were tasked with finding and executing villagers who were suspected of having current or past contact with opposition groups. At the beginning of 1999, they expanded into southern Tantabin Township in Toungoo District. At the time, their operations, artillery and uniforms were unlike other battalions. Soldiers selected to become members of these units were reportedly chosen by their propensity for cruelty; many of them wore military shirts along with a pair of short pants, giving rise to the name by which many villagers referred to them: Baw Bi Doh (‘Short Pants’). Though they were reported to have expanded their operations in Toungoo District as late as mid-2004, community members working with KHRG reported that in the beginning of 2005 they suddenly ceased identifying as part of the Dam Byan Byaut Kya and began operating solely as part of regular Tatmadaw columns. Throughout 2002, the Tatmadaw expanded its Pyithu Sit (People’s Militia) in many Karen areas. Beginning in March 2002, the Southern Command began forcing local villagers to join the Pyithu Sit. Community members working for KHRG at the time reported that villagers living near the Kler Lah relocation site, as well as from villages 20-miles away including Thu Keh Der and Htee Hta Pu, were ordered to meet recruitment quotas set by the government. In late 2003, Tatmadaw operations and troop numbers in the district swelled to support a relocation campaign and offensive in southern Karenni State. In January 2004, the informal ceasefire, commonly referred to as the ‘gentleman’s agreement’ did not establish restrictions on the movement of troops and supplies or the construction of army camps or roads. Despite the ceasefire, KNLA and State Peace and Development Council (SPDC) troops clashed on a regular basis throughout December 2003 and January 2004 . By the end of January the armed conflict had ceased, but the SPDC continued to move more troops into the area, stock its camps, build new camps and repair the Toungoo-Mawchi road and the Kler Lah-Buh Sah Hkee road. Villages in Toungoo District suffered some of the heaviest military attacks against civilians during the Tatmadaw military operations that began in late 2005. The Tatmadaw worked to extend and consolidate its military structures into the forested mountains of eastern Toungoo, which it had not previously been able to control. The Tatmadaw managed to extend its authority over autonomous communities by attacking rural villages, upgrading and constructing new vehicle roads, forcibly relocating local populations into military-controlled villages and relocation sites, and finally by establishing new army camps and bases. Prior to 2006, villagers in this area would return to their villages after Tatmadaw forces withdrew from the area, and rebuild what had been destroyed. In 2007, the civilian population became resistant and evaded the Tatmadaw. The inability to locate all the hidden displaced communities explains the rapid development and expansion of new military camps and bases in the area of the Toungoo - Kler La - Mawchi vehicle road, such as those at Saw Bpoo village (situated between Hsaw Wah Der and Kaw Thay Der villages) and at Maw Koh Der village as well as other sites north of the roadway. The start of 2007 marked a period of increased Tatmadaw presence along the forest trails connecting local villages in the area. Community members reported that in late 2007 the Tatmadaw in the south began sending spies, disguised as escaped convict porters, into displacement areas, to track down communities in hiding. The spies would pass location information to local SPDC Army units, so they could efficiently advance into the sites and constrict the time for villagers to flee. In 2008, the then-SPDC made a concerted effort to expand its control over Kler La and other areas of Toungoo District. The SPDC's militarisation campaign involved myriad abuses, including the conscription of local villagers into forced labour and restricting villagers' movements around the region. During this time, the Military Operations Command (MOC) #4 oversaw the widening of the Kler La to Buh Hsa Kee vehicle road, the north-south corridor that leads into northern Papun District and eventually connects with Pwa Ghaw, where the Tatmadaw operated a military base and a growing forced relocation site at the time. Life remained equally hard for villagers who chose to live in hiding and outside of SPDC control, particularly in regards to maintaining their livelihoods and growing enough food to eat while evading Tatmadaw forces. In 2009, SPDC troops from MOC #5 were rotated out of Toungoo District after two years of operations and replaced by units from MOC #7. Soldiers from KNLA 2nd Brigade also continued to be active in Toungoo District in 2009. Sustained military activity by MOC #7 combined with the broader militarization of Toungoo District heavily impacted civilian lives and livelihoods. Villagers living under full or partial SPDC control faced frequent demands for forced labour, especially as porters in support of troop rotations, re-supply and deployment. Individuals caught in violation of movement restrictions were heavily fined or even shot, while anyone suspected of having any contact with the KNLA faced destruction of their property, arbitrary arrest, detention and ill treatment. Villagers inhabiting or travelling to areas beyond SPDC control, meanwhile, risked being shot on sight if spotted by an SPDC patrol. In February 2012, community members working with KHRG reported that villages in Toungoo District, under the control of Tatmadaw Military Operations Command (MOC) #9, continue to face regular and ongoing demands for forced labour, specifically during military re-supply operations and road-building activities. Information received by KHRG illustrates that between November 2011 and February 2012, these demands have included villagers forced to use their own trucks and motorcycles to transport food and road-building equipment, to support road-building by driving in front of bulldozers in potentially mined areas and to clear brush, dig and flatten land to build new vehicle roads. In addition, villagers travelling on vehicle roads, including the Toungoo – Kler La road, are required to pay arbitrary fees at checkpoints and procure written travel permissions for their trips. 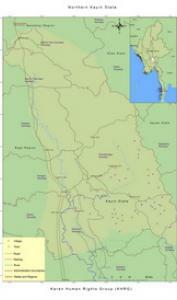 As of March 2012, Tatmadaw and KNLA troops are currently active in Toungoo District. Tatmadaw troops control areas near the east-west Kler La – Mawchi road and and also along the Kler La – Buh Sah Hkee road, where their army camps are based. KNLA troops have limited operations in Than Daung Township (Daw Pa Ko) and the northeastern part of the District, which is north of the Kler La – Mawchi road and east of the Dweh Loh River. The Tatmadaw Southern Regional Command Headquarters is permanently stationed in Toungoo Town, while larger bases are stationed along the Toungoo to Kler La to Mawchi Road, and the Kler La to Buh Has Kee Road, including Bpeh Leh Wah, Kler La, Gklay Soh Kee, Th'ay Hta, Gkaw Thay Der, Naw Soh, and Buh Hsa Kee. As of March 2012, Tatmadaw Light Infantry Division (LID) #66 and MOC #9 were based at the Southern Regional Command centre at Kler La army camp, which is on the east to west Toungoo – Mawchi vehicle road. There are two Tactical Operations Commanders (TOCs) under the control of LID #66, and a total of seven battalions under their command occupying villages in Tantabin Township. TOC #1 is based in Play Hsa Loh army camp and TOC #2 is based in Bu Hsa Hkee army camp located on a second vehicle road in the southeast direction from Kler La. Under these two TOCs, there are seven battalions occupying villages in Tantabin Township. Infantry Battalion [IB] #1 soldiers are based in 16-miles and 20-miles army camp and Ler Khaw, P’Leh Wa, Maw Pa Der and Kaw Soe Koh along the road towards Toungoo town; villages; LIB #5 is based in 48-miles miles camp and in nearby villages; LIB #6 is based in Kaw Thay Der, Naw Soe and Thee Muh Paw Soe villages on the road in the south eastern direction; IB #11 is based in Kay Bpoo village; IB #35 is based in Play Hsa Loh and Klaw Mee Der villages; IB #14 is based in Ker Weh village and K’Thaw Pweh; and IB #80 is based in Bu Hsa Hkee, Htee Htaw Per and Khaw Daw Koh. MOC #9 is also currently based at Kler La army camp with battalions under its control based along the north-south Day Loh Gkloh River in Than Daung Township, including LIB #375, LIB #603 and IB #92. Community members in Thaton District described a recent increase in the presence of private companies in the area that have forged relationships with regional leaders to buy permission to carry out natural resource extraction. Companies now operating in Pa’an, Thaton and Kyaikto Townships are allegedly responsible for forcing villagers to sell their land for mining projects. Gold-mining between Waw Mu and Bilin at the end of 2010, restrictions on transporting petrol by motorboat. In Kyaikto, Pa’an and Thaton Townships, companies solicited permission from the KNU to mine, they are forcing villagers to sell their land. KNU selling logging rights to Saw Maung Hla Aye and Min Thein in Htee Law Bper forest near to Mae Baw Kee village, Noh Ber Baw village tract. Military camp in Ta Kaw Bo built using forced labour. Thaton is also the region of eastern Burma that is the most accessible for humanitarian and development groups operating from Yangon; for example, in May 2011, a community member in Bilin Township described UNDP agricultural training, social credit and self-reliance projects. In 2005, Asia World Company and the Tatmadaw started construction of a hydroelectric dam on the Tun Boh River. This project involved the displacement of nearly ten villages in Tantabin Township, with over 3,000 acres of land confiscated for the project site. The dam will flood an estimated 30,000 acres when complete. In order to establish security, the Tatmadaw installed several military bases and checkpoints along roads leading to the project area. The dam was originally planned to be complete in 2010, but remains incomplete as of August 2012. In villages affected by the Tun Boh Dam project, villagers experience difficulties with accessing food, quality education, and adequate health care. Although villagers may have access to a medic, KHRG received a report that a medic in Noh K’Maw village tract has been discovered to be illegally charging patients for treatment, which turns out to be only an ineffective placebo injection. This treatment is the only alternative, because villagers are prohibited from transporting medicine. Villagers also lack the resources to travel to other areas where they might receive treatment. This Interview with U L--- describes events occurring in Htantabin Township, Toungoo District, between 2012 and 2016, including land confiscations, livelihood challenges, displacements and unjust compensation.